Have any of you been following the Urban Jungle Bloggers? It’s a fantastic initiative started by my talented friend Judith from the blog Joelix and Igor from the The Happy Interior Blog. I’ve been enjoying the Urban Jungle images over the past year and seeing how the series is evolving and growing. The idea behind Urban Jungle Bloggers is to style an image in your home using primarily green plants and whatever other props go along with the monthly theme. And there have been some absolutely beautiful images created in this series. To see some of these images check out their Pinterest board, their Facebook page or the #urbanjunglebloggers hashtag on Instagram or Twitter. When I decided to participate I spent days thinking about how I could style a nice image with some of my house plants and incorporating this month’s theme which is “Green Spring/Easter Styling”. When I think of Spring or Easter the colour yellow immediately comes to mind (and actually when I think of Judith I also think of the colour yellow!). For me it’s a colour that represents light, energy and happiness just like the start of Spring after months of a cold and grey winter. 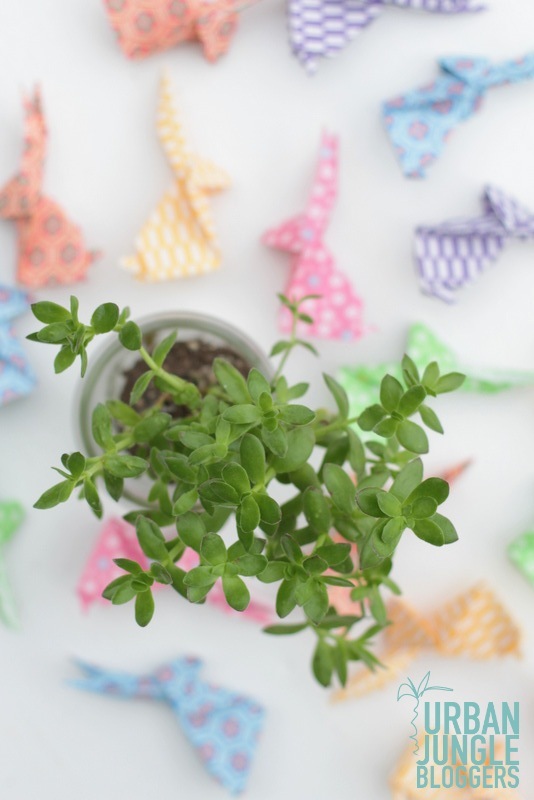 I also had the idea to incorporate a little bit of Origami (of course) to give a hint of Easter. When I finally had the image in my head I set to work to try and translate it into a photo. I am by no means a stylist (as you can most likely tell) so I spent hours tweaking props, changing rooms for light purposes, swapping lenses every few minutes, sweating profusely and dropping the f-bomb a few hundred times (luckily my kids were at school). I have so much respect for all you talented photo stylists out there! It’s hard work. In the end I didn’t achieve my exact mental image but I did come up with a few shots that portray what Spring/Easter is to me. I wanted to keep it simple and clean and not crowded with too many “things”. I found all of the flowers I used in my garden (the forsythia, daffodils and dandelions) and either left my succulents un-potted in the shot or planted in clear jars (I love being able to see the dirt and roots). As you can see, my ideas changed (quite drastically) a few times during the shooting process. Thanks for letting me play along Judith and Igor! Thanks! Enjoy your time in the mountains. I love it, Jill! Really love how you kept it natural with flowers from your garden.Thanks for all the hard work on shooting your images, the result looks so good!! Did you get any origami help from your kids? Yellow is the best, no? Love your photos! The origami rabbits are very funny. Nice idea for Easter! I have these origami rabbits all over my house! 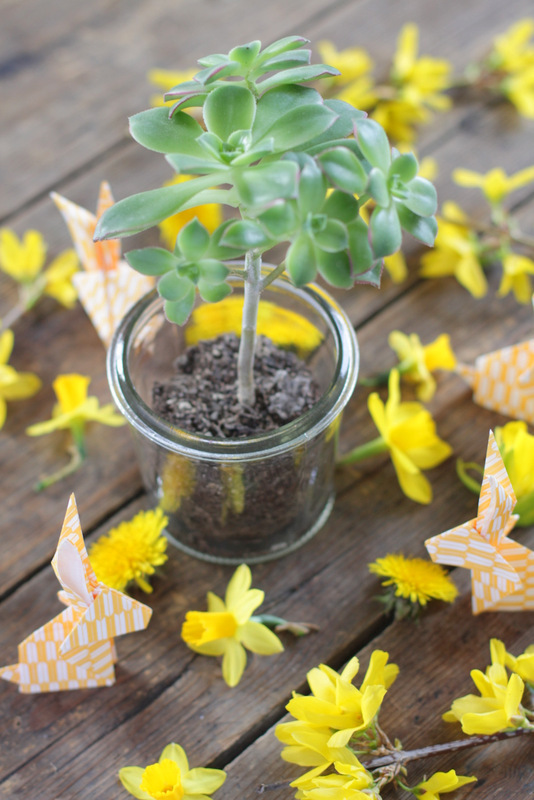 They are indeed very sweet and perfect for a simple Easter decoration. These are so happy and gorgeous. Realllly great work. You sell yourself short, you are definitely a stylist! Aw, thanks Jen. You know how to make a girl feel good about herself. This is such a beautiful styling, Jill! 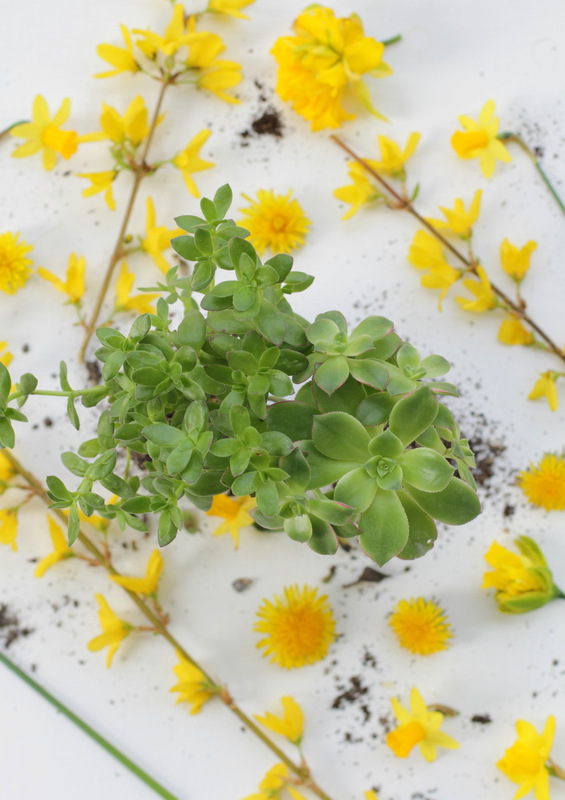 I have serious plant envy now:-) Love how you added a bright and happy yellow dash – seems to be THE spring colour! Thanks so much for joining our little green family! Thanks Igor. Already looking forward to next month!